In its first-ever concert held during the academic year, the internationally acclaimed Bates Dance Festival collaborates with the Bates College Concerts Committee to present Beautiful Me by the renowned South African company Vuyani Dance Theatre Project at 8 p.m. Friday, Oct. 16, in Bates College’s Schaeffer Theatre, 305 College St. The performance kicks off the troupe’s North American tour. Tickets, at $20 for the general public and $12 for students and seniors, can be purchased on line at: www.batesdancefestival.org. (One hundred free tickets will be available at the door to Bates students on a first-come, first-served basis.) For more information call 207-786-6135. Musicians from Vuyani offer a jam session in a Bates Noonday Concert at 12:30 p.m. Tuesday, Oct. 13, in the Olin Arts Center Concert Hall, 75 Russell St. Maqoma and other members of the Vuyani Dance Theatre give a pre-performance talk at 7:30 p.m. the evening of the performance in Schaeffer. A global fusion of rousing live music sets the pace for this solo tour de force by the exquisite dancer and choreographer Gregory Maqoma, a rising star on South Africa’s dance and theater scene. Beautiful Me speaks honestly about the profound task of finding one’s authentic voice and redefining our notion of postmodern African choreography. Maqoma invited three of the world’s most refreshing and articulate choreographers to contribute their unique voices to Beautiful Me: Akram Khan (U.K.), Faustin Linyekula (Democratic Republic of the Congo) and Vincent Mantsoe (South Africa). The result is an expansive movement vocabulary that layers influences of contemporary Kathak (classical dance from India), Afro-Fusion and visual dance theater with breathtaking precision and lyrical warmth. Against a soaring score for violin, cello, sitar and percussion, Maqoma traces the personal journey — and larger social history — that led to his own rich theatrical form. Incorporating movement, music and text, the production plays out as a series of conversations culminating in a heartfelt, kinetic reflection on African identity. Born in Johannesburg, Maqoma is regarded as a visionary in South Africa. He started creating dance in a youth club in Johannesburg. He began his formal training with Moving Into Dance Mophatong, a Johannesburg-based school and company, in 1990, and was accepted into the company a year later. In 1994 he created his first work for them. In 1997 he received a scholarship for a choreographic program, Dance Web in Vienna, and in 1999 a scholarship to study at Performing Arts Research and Training Studios in Brussels. While in Brussels, Maqoma formed Vuyani Dance Theatre Project. Works he has choreographed since then include “Layers of Time”; “Rhythm 1, 2, 3”; “Rhythm Blues”; “. . . and denial, and silence and ignorance. . .,” commissioned by the Pretoria Technikon Dance Department; “Autumn Harvest,” commissioned by the International School Company in Amsterdam; “Revolution,” for the Dunhill Symphony of Fire in Lagos, Nigeria; “Miss Thandi,” a tribute to Raymond Matinyane commissioned by the 2002 FNB Vita Dance Umbrella festival; and the recent “Beautiful Trilogy,” of which “Beautiful Me” is the final part. 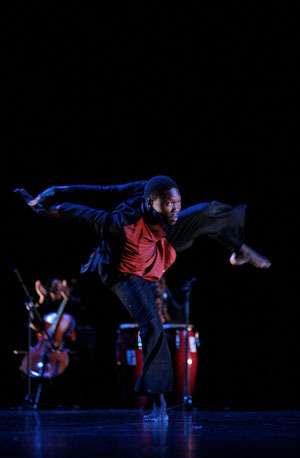 Maqoma’s numerous awards include several from FNB Dance Umbrella and the 2002 Standard Bank Young Artist for Dance Award. Also in 2002, he was nominated for the prestigious DaimlerChrysler Award, and in 2004 he was selected as a potential Protégé for the Rolex Mentor and Protégé Arts Initiative. Under Maqoma’s direction, the Vuyani Dance Theatre Project has grown to include the Vuyani Ensemble, a project-based experimental jazz ensemble that aims to create a language of music representative of the company vision and performance style. In addition to working as a choreographer, in 2002 Maqoma co-produced New Directions, a dance program for the Standard Bank National Arts Festival, together with Moeketsi Koena, Sello Pesa and Mandla Mcunu. In 2003, he served as artistic leader for the Afro-Vibes Festival in Holland. Today he is associate artistic director for Moving Into Dance Company. Additionally, Maqoma teaches and choreographs for other organizations and gives workshops internationally on African dance, culture and choreography. Support for this project comes from the following Bates College offices: the College Concerts Committee; the offices of the college president, Institutional Diversity, dean of the faculty and dean of students; the Africa GEC/Mellon Innovation grant; the Multicultural Center; Humanities Division; the dance and Learning Associates programs; Harward Center for Community Partnerships; and the International and Africana clubs.